The Sherlock Holmes Reviews: A Creperie for a Special Treat! 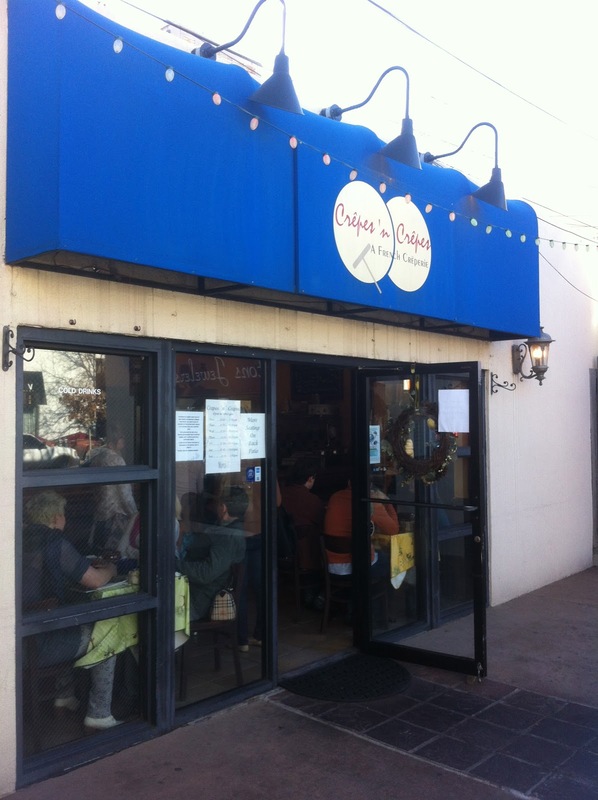 On our last day in Denver recently visiting the Baroness of Downing, she had us visiting an area we had not been to in over 25 years, the Cherry Creek Shopping District, for a quick spin thru and a stop in to a little French place for brunch called Crepes and Crepes. Sequestered away between two forward sitting outcropped storefronts, it's very easy to stroll right by but resist that urge and seek out this delectable denizen of dining for while the outside of this abode is nothing to look at, the inside is beguiling in it's railroad flat chock-a-block manner of internal design. Not since our adventures on I'le St. Louis in Paris had we found as delicate AND as formidable a French breakfast parlor and Crepes and Crepes certainly delivers. With Crepe choices tempting us such as Seafood Provencal (Salmon, Scallops, Crab, and eggs in a white wine bechamel sauce) or the Fresh Strawberries and Blueberries with Chocolate Sauce (from the 'savory' side and the 'sweet' side respectively), we chose to relax a bit, read thru the menu carefully and.............order an Irish Coffee (or two) in order to make certain we all chose expertly. Thus it was that we were brought a Ratatouille Crepe for the Baroness, a Wild Mushroom Crepe for Watson (Champignons sauvages domestiques aver sauce aux champignons) while I chose a Florentine Crepe of Spinach, Canadian Bacon, and Jarlsberg Swiss cheese..... and another delicious Irish Coffee in a mug as large as the English Channel. All were savory, scrumptious, and delicate and made with eggs melded inside in the style of our choosing. Completely satiated and a little wobbly (darn Whiskey!) we made our way back thru the rooms towards the front door with the feeling that we had stepped back into a little French ambiance and gastronome and found ourselves back out in the shopping district. Once back out on the sidewalk the memories came flooding back. No visit to this enclave could be complete without due homage paid to two of the anchors of this area from eons ago: The Bay Wolf Restaurant and the original Tattered Cover Bookstore. It appeared to me that the famous Bay Wolf Restaurant and Jazz Club was located on the west side of Detroit St. between 2nd and 3rd and was reached by stepping down the brick steps that now lead one to a ...... Yoga Studio............ and it was here at the Bay Wolf that I had once feted one Miss Irene Adler on an inaugural date and subsequent christening of an American Express card that they certainly had NO sense in sending to me in the first place. My financial standing at the time was similar to that of a fine brassiere: No visible means of support. Nevertheless it was a very special occasion and left a lasting memory only now recalled fondly. Similarly, walking along 3rd Ave I spied what I might venture was the 2nd 'original' location of the Tattered Cover Bookstore, now an Artisan's Center. For it was so many years ago working on a case after leaving the University that had me 'posing' as a N.Y. Times delivery person in this now gentrified neighborhood. Picking up the stacks of the news at Stapleton Airport where they had been 'flown in' after printing back in NY, I brought The Olde Gray Lady to nearly all of the metal delivery boxes in Cherry Creek as well as many of the 'more informed' homes nearby. It was only after several months of painstaking detective work and diligent planning that I was then entrusted to this particularly coveted route, one which not only gave me exposure to a sizeable amount of coinage but also access to a much greater treasure. Hidden amongst the stack of newspapers at Stapleton was a cash burlap bag filled with dozens and dozens of quarters mixed with perhaps hundreds or rubber bands, buried together to keep the jangling to a minimum lest they should draw attention to the carrier needlessly. Quarters that were then used to gain access to the boxes, retrieve the old papers and deliver the new ones inside. Yet the 'golden treasure' was being given The Key to the Tattered Cover! The responsibility was palpable and was handled with the gravity that such responsibility warranted. With key in hand I was entrusted to open the store door (all these deliveries took place between 12:00 Midnite and 2:30 am under cover of darkness), disable the alarm, deliver the Times to it's place at the front of the aisle near the register and remove remainders. Then I was to scurry back the same way I had come, reset the alarm, close and lock the door and return to my delivery coach and spirit away before being discovered. As my first assignment as a 'detective' I had discovered that I had been plucked from the seeming hordes of applicants because I had for years been an avid recipient OF this fine paper and as such had been deemed to have the integrity and the strength of character to be entrusted with such responsibility. This was a lesson that I kept with me inside and continue to hold to even now for what is it but the trust of others that allows one to keep your wits about you, especially when all others seem to be losing theirs. So as we left the Baroness to her own designs that Sunday afternoon, Watson and I headed out towards Mayor Federico Pena Blvd. reminiscing about the hoopla back in the day about the space and urban planning needed to replace Stapleton Airport which was being quickly over run with housing and commercial development. The thickness of 'The Brown Cloud' pointed the community leaders then, headed by the Mayor (and his marathon running wife Ellen) towards placing DIA in what could only be viewed than as Kansas. Sly as a Fox that one! True leadership is understanding that your decisions may not always be popular when they are made but that if your faculty's are correct and your deductions reasoned, the ultimate good will will be paid once the wisdom of your decisions is recognized.......sometimes many years later, sometimes only after your passing. It is fortunate for all who visit this Queen City that such wisdom was evident so many years ago and that Mr. Pena and the city planners of his day took such bold steps. 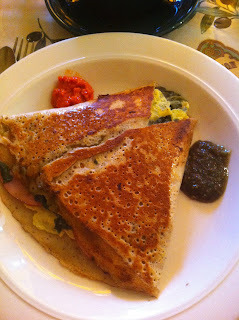 Crepes and Crepes is a jewel to be treasured and should be visited for a treat not afforded us often!